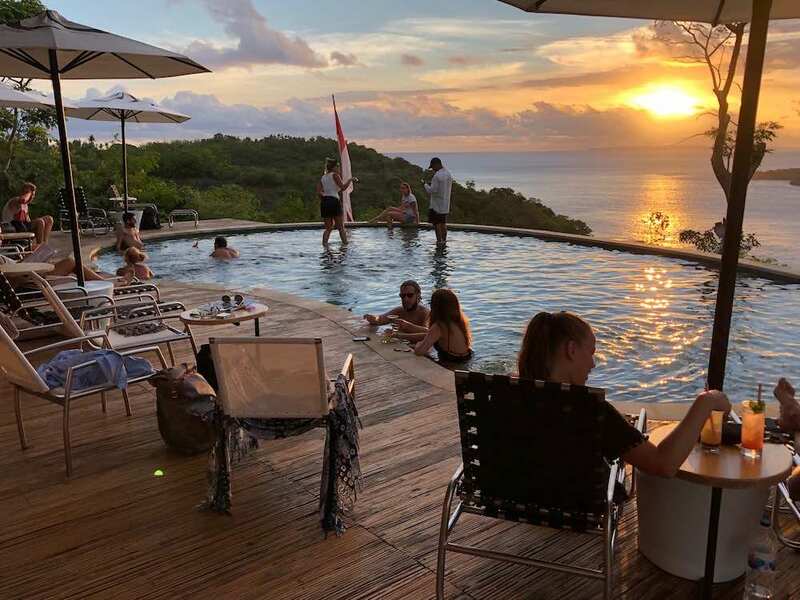 Amok sunset bar and restaurant enjoys an exceptional location, facing west, at the top of a promontory overlooking the sea. A great place to have lunch, dinner, to spend the afternoon by the pool or to view the sunset. 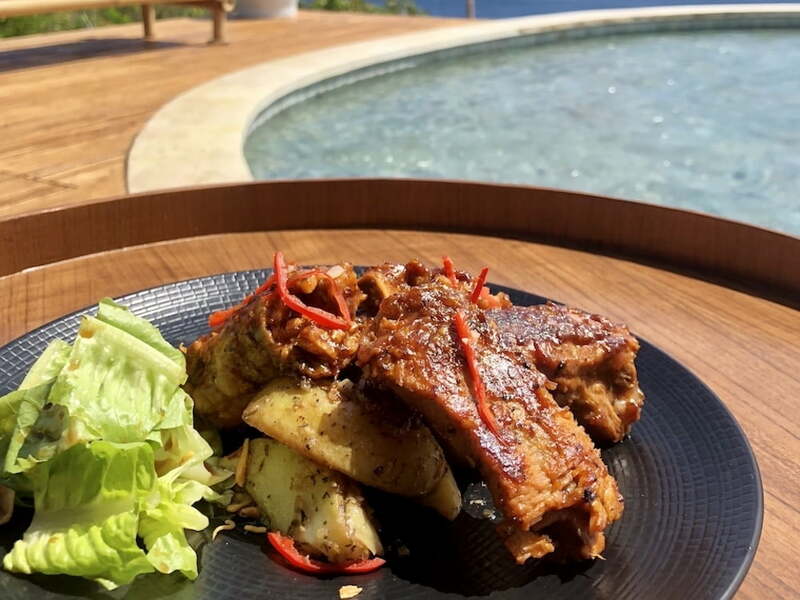 Amok sunset bar and restaurant opened in Nusa Penida in August 2018. 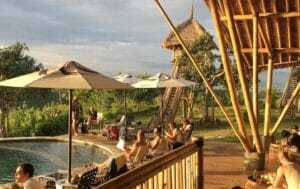 Its location is unique, facing the sunset on one side and Mount Agung on the other, on a hill overlooking the sea close to Gamat Bay. This unique location deserved an exceptional concept ! The concept is based on three drivers : being respectful of the environment, leveraging the amazing view and offering a unique experience all day long. Care for the environment led to the use of local materials, in particular bamboo, for the construction. Several meters high platforms offer private spaces with a 360° view around. The swimming pool allows to enjoy the place during the afternoon or at sunset. Amok sunset bar and restaurant is organized around a large building, traditionally called Bale Bale in Bali. It is built with bamboo for the structure and the floor, and with Alang-Alang for the roof. This Bale Bale has a large space that hosts the restaurant and bar, facing the pool and the sunset. The technical parts (kitchen, toilets, etc.) are located at the rear of the building. Bamboo platforms allow to enjoy the sunset or dinner in a private space. 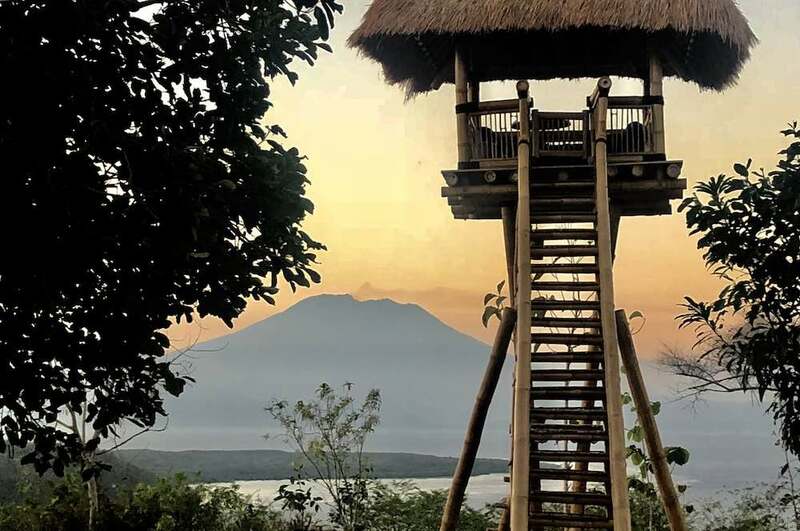 They are located 3 meters high to offer a 360° view of Mount Agung, the sea and Nusa Penida’s landscape. The are called the Nests ! Amok’s pool allows you to cool down during the afternoon or to enjoy a signature mocktail or cocktail, a beer or a glass of wine at any time. It has two beaches on each side to lie in the water and a shallow central area. I would be surprised if you do not ask someone to take your picture in the pool with the sea and the sunset in the background ! Amok sunset bar and restaurant staff was recruited and trained in the spring of 2018. The main criteria were skills, past experience but also a good understanding of the importance of customer satisfaction. They come from different horizons but one third of the staff comes from Nusa Penida. The whole training period was an opportunity for them to get to know each other. They now form a very close team. The team also actively participated in the development of the restaurant menu and the list of drinks. All the staff has been very enthusiastic and very involved in the opening of Amok. 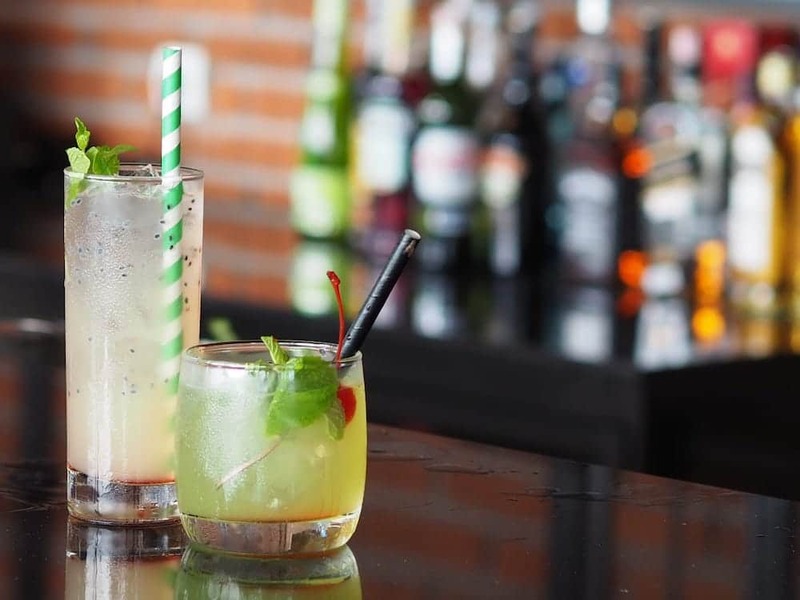 The cocktail and mocktail menu was specially made for Amok with two Bali-trained bartenders: Agus, who comes from Batu Madeg village in Nusa Penida, and Arif from Lombok. Mocktails (non-alcoholic cocktails) are prepared with fresh fruit juice. The cocktails include vodka, gin, rum, tequila, whiskey, tequila but also use a local arak. During Happy Hour, from 5pm to 6pm with a second cocktail is offered for each cocktail paid. Amok Restaurant and Sunset Bar also offers a wide selection of wines by the glass or by bottle. The menu was designed by Chef Akbar, who comes from Jakarta. The dishes have been specially designed for Amok restaurant. They were created following an inspiration of international fusion cuisine, adapted to use fresh and local ingredients. The menu also includes vegetarian dishes. Amok sunset bar and restaurant is open daily from lunch until 7pm or later for those who decide to stay for dinner. It is also possible to book in advance for dinner, but it would be a shame not to enjoy the sunset, very spectacular as of 5.30 pm.